It’s always interesting when a clinical trial you’ve been watching reads out. One of the first posts I wrote for this blog was about a clinical trial that Coronado Biosciences was running based on the hygiene hypothesis. The company was testing the efficacy of T. suis ova (pig whipworm eggs) in treating Crohn’s disease. Well, Coronado Biosciences just released the results of a phase 2 trial (TRUST-1) and they are not positive. It was a double-blinded, placebo-controlled trial of 250 patients with moderate to severe Crohn’s disease, so a positive signal would have been pretty convincing evidence of the efficacy of the therapy. 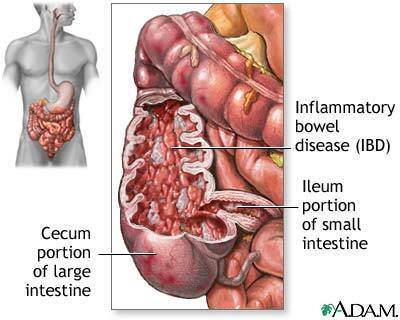 The primary endpoint of the trial measured response using the Crohn’s Disease Activity Index (number of patients who see a >100-point decrease in CDAI) and the secondary endpoint measured induction of remission (number of patients who achieve a CDAI score of less than 150). For both endpoints, there was no significant difference between the treated patient population and the patients who received a placebo. This is not a “we almost made it” result, but rather a “this doesn’t work at all” result. The company did see a small signal in patients with very high CDAI scores (> 290), but unfortunately it was not statistically significant. Coronado blamed it on a higher than expected placebo response, which may at first glance seem like a cop-out, but is actually quite common in trials for relapsing-remitting inflammatory diseases. Another European trial is underway (TRUST-2) so Coronado will have a second chance to prove the therapy works, but things don’t look very promising at this point. Crohn’s disease is a pretty tough market to compete in as several effective therapies already exist. Even if TRUST-2 has a positive read-out, it’s unlikely the efficacy would be enough to support commercialization. Coronado is also running trials of T. suis ova in several other indications including ulcerative colitis, multiple sclerosis, autism and psoriasis. I’ll be following those trials closely as a positive outcome would be an incredible jump forward in our understanding of the immune system and offer new therapies for patients who often have few other options. I’ll keep you posted. Are small biotechs more productive because they have no other choice? Over the last few years, much has been written about the poor R&D productivity of the big pharma companies. There is a bit of a controversy as to whether or not small biotechs are truly more productive, but one can’t deny that many of the new drugs being launched didn’t originate from the labs of companies like Pfizer or Sanofi, but rather small, resource-constrained biotechs like Seattle Genetics (Adcetris) or Optimer (Dificid), to give a couple of examples. Why is this? Many theories have been bantered around such as biotech’s more collaborative culture, the agility of smaller companies or the science vs. financial-focus. I think all of these ideas have merit, but I would like to examine another cause that I think many people overlook: small biotech companies don’t have a lot of other options. Now before you say “Yeah, I’ve heard this before, it’s do or die at the small biotechs”, hear me out because that’s not quite where I’m going with this. This type of thing goes on all the time at the big pharma companies; with research budgets in the billions of dollars, R&D portfolios are constantly re-evaluated and resources are reallocated. From the top, this makes sense since why would you put $500M into project A, when putting $500M in project B gives you a bigger NPV (at least according to your model)? The problem is, portfolio strategy is not an exact science and when one of those assumptions you made in your forecasting changes next month, your resource allocation can end up looking completely wrong. Now contrast that with a small biotech company. A handful of scientists and business folks find some promising technology and decided to develop it. They spend months trying to line up financing and when they do, they have a nice pile of cash that has one purpose: develop the idea they started with. Now this isn’t to say that development plans don’t change, because they do, but the thought never crosses their minds “Hey, maybe we should stop working on this compound and try something different, we can always come back to it.” Even when things appear gloomy and failure seems almost certain, there is no real path other than forward. They aren’t competing against another project for resources because there is no other project. There is no opportunity to put things on “pause”. 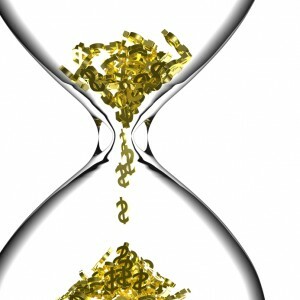 Projects keep going until they either fail or the money runs out. What is the consequence of this lack of options? Projects that one day seem like a dead-end keep getting funded (for a while at least) and some of those turns out to be great ideas after all. The same project in a big pharma company? It gets shelved and may never see the light of day again. How can big pharma fix this problem? Well, the answer isn’t that straightforward. As I mentioned, portfolio strategy is not an easy thing to get right and handing over a multi-billion dollar per year R&D budget to scientists to play with isn’t in the realm of possibility either. What we are seeing is a strategy by big pharma companies to cut R&D budgets and use that cash to support academic research and emerging biotechs. Is this the right strategy? Only time will tell. The answer to that question is important to a lot of people, namely insurance providers who pay tens of thousands of dollars a year for each patient who takes drugs like Avastin, Epogen and Rituxan. The issue is so important in fact, that the Congressional Budget Office conducted a study that estimated that the government could save up to $25 billion dollars over 10 years from the introduction of biosimilars. The problem was, until the Health Care Reform Act was passed last year, there was no regulatory process to approve biologic drugs. With the passage of the bill, the FDA was given a mandate to create such a regulatory process. Problem solved, right? Not so fast. There are two specific issues that seem to be taking the wind out of the sails for those promoting biosimilars. The first issue is the approval pathway. Back in August, Janet Woodcock (director of CDER at the FDA) and others published an article in the New England Journal of Medicine outlining the FDA’s view of a potential biosimilar approval pathway (keep in mind that the health care bill simply told the FDA to create a pathway, it didn’t actually lay out how to do it). The article is worth reading, but the best way to summarize it is “We’ll figure it out as we go.” Yikes. Not exactly what companies want to hear when it comes to estimating the risks of investing in the development of a biosimilar. Now, I’m not blaming the FDA for saying what they said; biologic drugs are incredibly complex compared to small molecule drugs (see figure below) and until the FDA has had a chance to “test” the approval pathway, they can’t really come out and say “Do X, Y and Z and we’ll approve you drug.” So what does this mean? For the most part, the only players in the biosimilar market will the big biopharmaceutical companies who have both the expertise and more importantly, financial backing, to forge an approval pathway. Think of the process less like hiking in the Rockies with a compass and more of using a machete to cut a path through the dense jungles of South-East Asia. This image gives you some idea of just how complex biologics are. 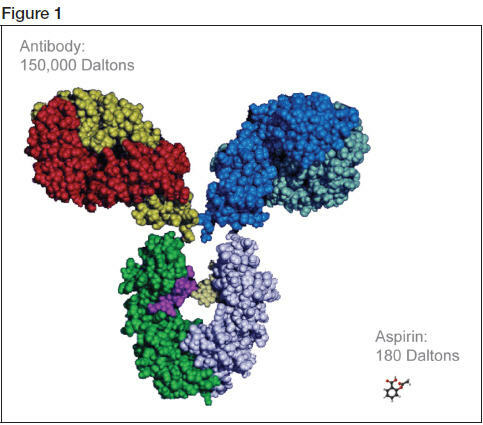 On the right is a molecule of aspirin and on the left is an antibody (a number of biologics are antibodies). The second issue is physician and patient perception of biologic drugs. Small molecule generics are literally the exact same drug as the branded products, at least to the degree that we can tell (which is really well). Not so with biologic drugs. Heck, it’s not uncommon for a company that produces biologic drugs to have difficulty producing consistent batches of them in their own plants. In light of this, physicians will likely be very wary of switching a patient from a branded biologic to a generic, especially since biologics are often used to treat conditions where drug efficacy can be a matter of life or death/debilitation (cancer, MS, etc). In fact, Decision Resources recently release a report where a majority of surveyed physicians said they would hesitate to prescribe a biosimilar for a patient, unless the biosimilar had gone through phase 3 trial for that indication. Ouch. Phase 3 trials are typically the most expensive part of drug development and their costs can easy run into the tens of millions of dollars, if not more. If a company is required to conduct such trials, the likelihood of a biosimilar being 80-90% cheaper than the branded generic is pretty much zero. So all in all, biosimilars have a pretty rough road ahead. The big biopharmaceutical companies are already making serious investments in the area since there is a lot of money at stake, but it’s not a task for the faint of heart. Most likely we’ll start to see biosimilars of the relatively simpler biologics like the insulins, where the cost of development is more predictable and less costly. Either way, it’s an interesting area to keep an eye on because I have no doubt that there will be some spectacular successes in the area and some spectacular failures. Can the DMV innovate? Why yes it can! Since nearly everyone has experienced the frustration of visiting the DMV, I’ll spare you the details of my latest visit. It was no better and no worse than the DMVs I’ve visited in other states. The only thing that helps keep me sane during these visits is identifying all the inefficiencies and imaging the numerous ways that service could be improved. I liken it to what world peace would be like: a pleasant though, but something impossible to achieve. Or is it possible? Well, let me share with you what happened in my hometown almost 20 years. In Canada, the province of Alberta (prior to 1993) had a system very similar to the DMV system that you see in many states. Just like in the US, it was a painful process to get a driver’s license or register your vehicle. In Calgary, a city of about 800,000 people at the time, there were a grand total of two registry centers (the equivalent of DMVs). The hours were terrible, customer service was non-existant and the waits were long. In 1993, the Alberta government decided to privatize the registry system, or at least the front-office part. What happened? Well, this map show one change that occurred. 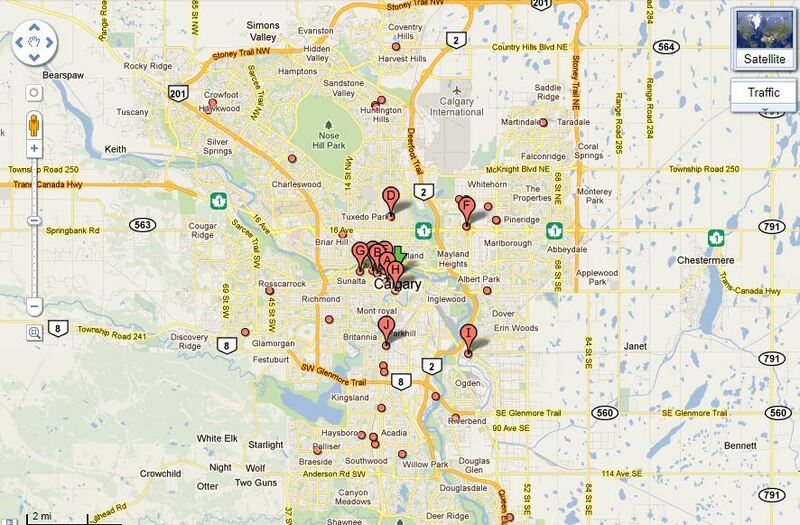 Nearly everyone of those red dots is a registry services business. I’m sure google picked up a few other businesses by accident, but right now there are 25+ registry services businesses in a city of just over one million. Talk about options! Before I left the city, I had a chance to experience the new system. I needed a copy of my long form birth certificate. So I looked up the closest registry services business (less than 2 miles away!). But will they be open? Why yes! Their hours, Monday through Friday are 9am to 9pm (no need to leave work early!) and they are open on the weekend too. I drove over, parked the car and walked in. There were 2 people in line. After a 3 min wait, I walked up to the counter and inquired about gettting a copy of my birth certificate. No problem! After filling out a form, the very pleasant lady entered my information into the computer, asked me a few questions to confirm my identity and said the birth certificate would be delivered by mail in less than a week. Great! I don’t remember what it cost me, but I do know they accepted credit cards. I was in and out in less than 10 minutes. I had a similar experience when I renewed my driver’s license a couple years later. Today, the registry services businesses allow you to do the following quickly, painlessly and with great customer service: get a driver’s license (including the test), register a vehicle, register your business, get a marriage license, do a land title search, put a lien on property, change your name, get an Alberta healthcare card and even obtain a raffle license for your fundraiser. If there is one thing that excites me about the biotech industry, it’s the possibility that everything that we think we know about how to treat a disease will get turned on its head. A great example of this is the Nobel Prize winning work by Barry Marshall and Robin Warren on the role of H. pylori and stomach ulcers. Despite the dogma at the time that blamed ulcers on stress and poor diet, Marshall and Warren combined creative thinking and careful scientific exploration to prove all of it wrong. And to top it all off, their discovery lead to a treatment regime that cures H. pylori infections (and typically ulcers as well) in over 80% of patients. Coronado Biosciences isn’t there yet, but they just announced that they will be submitting an IND application later this year for their novel treatment of Crohn’s disease, CNDO-201. 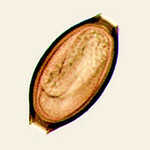 What makes this treatment so unique is that it composed of T. suis ova, or, as they are more commonly called, pig whipworm eggs. The theory behind this treatment is the so-called “hygiene hypothesis“, or the idea that as we improve our living conditions through the elimination of what were once common infections, we are disrupting the development of our immune system. Since humans have suffered from these infections for hundreds of thousands of years, the thought is that our immune system depends on exposure to these pathogens for its proper development. Immune system regulation pathways are far from simple, so I’ll leave it up to the reader to investigate the details, but simply put, the hypothesis is based on T-helper cell feedback between Th1 and Th2 cells. Basically, stimulating Th1 cells (through exposure to bacteria and virus) downregulates Th2 activity, which is responsible for the inappropriate immune responses that lead to conditions such as allergies and eczema. It gets even more complicated when we start talking about autoimmune diseases such as Crohn’s disease or multiple sclerosis, since these are Th1 mediated immune responses, however, theories have been put forth to explain the role of pathogen exposure in these diseases as well. What makes this news so exciting is that Coronado Biosciences is prepared to move forward with clinical trials in this area based on some very positive data from a number of independent investigator trials (you can find the trial results on their website). In one open-label, non-comparative study of 29 patients with Crohn’s disease, 66% of patients entered remission at 12 weeks and this increased to 72% of patients at 24 weeks. This is quite remarkable as the tool-of-last-resort for treating Crohn’s disease, anti-TNF-alpha drugs such as Remicade and Humira typically see remission rates in ~30% of patients. The caveat of course is that this was a open-label study with a small number of patients and until more rigorous studies are completed, we won’t truly know the efficacy of this treatment. Until then, I’ll keep my fingers crossed and continue to give Coronado Biosciences a pat on the back for exploring a truly novel treatment paradigm, that if successful, could fundamentally change how we treatment autoimmune diseases.